Dominion: Was the fix in for Mi’kmaq Warriors at Elsipogtog? 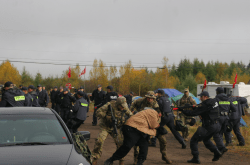 Was the fix in for Mi’kmaq Warriors at Elsipogtog? MONCTON, NB–Coady Stevens, the first of six Mi’kmaq Warrior to appear on charges related to the anti-shale gas encampment along Highway 134, has been denied bail. As bail hearings today continue for the five remaining incarcerated members of the Mi’kmaq Warriors Society, enough information is beginning to surface to suggest that the vicious pre-dawn RCMP takedown of the anti-shale gas encampment on the morning of October 17th was a well known fact among some before it happened. This is not to suggest that these people necessarily knew of the severity or magnitude of the RCMP raid, or even what it would look like. On the other hand, the possibility that others knew of the raid on October 17th is becoming too real to ignore. Not only this, but there is a clear possibility that the greater narrative behind the raid is the measured destruction of the Mi’kmaq Warriors Society, to be replaced in their stead by a joint Assembly of First Nations/RCMP force. Did Elsipogtog First Nation Chief Sock know that Thursday was the day? Much has been made of the fact that Chief Sock and members of his council were arrested on the morning of October 17th. Sock and council were arrested in the second confrontation with RCMP, after the police had swept through the encampment, making numerous arrests, with guns drawn in the pre-dawn hours. What brings Sock’s pre-awareness of the events of the 17th into question is a series of notes obtained by APTN journalist Jorge Barerra. The notes, which Sock has since admitted to Barerra that he penned, were taken during a meeting between Chief Sock, Robert Levi and ‘Jumbo’ Sock, who are both councillors from Elsipogtog First Nation, Tobique First Nation member John Deveau and Listiguj First Nation member Wendell Metallic, and two provincially-appointed advisors and other members of the New Brunswick provincial government, which included premier and Aboriginal Affairs Minister David Alward, as well as Energy minister Craig Leonard. The Sock notes suggest that the talks focused, at least for a period, on a timeline of when to take down the ongoing blockade. These notes were written on Monday, October 7th, so it is reasonably safe to conclude that the “next Wednesday” in question refers to Wednesday, October 16th. The Thursday in question is October 17th, the date of the vicious raid. Granted, Sock does continue to publicly denounce SWN Resources Canada’s seismic testing in the area. In an attempt to patch up relations between his community and the RCMP, he even helped clean up the wreckage of six torched police cars. But based on his own notes, one must consider the possibility that he was aware that there was a plan in motion to dismantle the encampment and end the peaceful anti-shale gas encampment on Thursday, October 17th. A blockade of millions of dollars of seismic testing equipment, without which SWN could not work, is one thing. A peaceful protest alongside the highway, where people can vent their indignation without actually stopping the Texas-based company from testing for shale gas deposits, is quite another. One is effective, albeit potentially illegal in the eyes of the Crown. The other is a co-option of energy towards ineffective means, that is, if you actually want to stop the company from working. Deveau, one of Sock’s provincially-appointed advisers, is an intriguing character and no stranger to the anti-shale gas protests in Elsipogtog. We have written in more detail about him here. But to fully understand his role in the current anti-shale gas movement – and it is a big one – we need to back up for a moment to late June of 2013, when Elsipogtog’s anti-shale gas movement was being led by Elsipogtog ‘War Chief’ John Levi. After 12 anti-shale gas arrests occurred on June 21st, 2013, along Highway 126 in Kent County, the community of Elsipogtog was understandably up in arms. A eight and a half month pregnant woman had been arrested, and an elder had been roughed up enough by RCMP that she was bleeding from the mouth by the time they zip-strapped her and tossed her in their wagon. In response, on June 23rd, two new players were introduced to the community during a town hall-style meeting in Elsipogtog. The first was the Mi’kmaq Warriors Society. The second was Tobique First Nation member Wendell Nicholas. When first brought before the community of Elsipogtog, Nicholas was introduced as a ‘UN Independant [sic] Observer’. His rather vaguely defined mission at the time was related to making observations and preparing an upcoming report for a branch of the United Nations. Claire Stewart Kannigan, working for rabble.ca, identified a mis-print on Nicholas’ shirt and started snooping. When Kannigan couldn’t find an established connection between Nicholas and the United Nations, and proceeded to out him on rabble, Nicholas promptly re-branded himself – with the assistance of a Chief Sock-led press conference – as the leader of a new ‘peacekeeping’ team known as the ‘Elsipogtog Peacekeepers’. In the midst of a heated summer of protests, with residents tired of watching their community members being roughed up by the RCMP, the press conference introducing Nicholas was awash with hand shakes, ceremony and praise for Nicholas’ new team – even if his role wasn’t entirely understood beyond being something of a liaison between Elsipogtog band council and the RCMP. As it turn out, Nicholas is something of an old hand in the game of liaising between First Nations communities and the Royal Colonial Mounted Police. In fact, he is the brainchild behind the Public Safety Cooperation Protocol (PSCP). At the very least co-authored by Nicholas in 2004, the PSCP is amongst the modern day memorandums that facilitates sharing information between Indian Act chiefs and the RCMP on Indigenous unrest across Turtle Island. It is, in essence, an agreement between then AFN Chief Phil Fontaine and RCMP Commissioner Zaccardelli – on behalf of the Queen – to spy on and squash Indigenous grassroots unrest before it starts. The terms used in the PSCP are more flowery and bureaucratic than that, but the song remains the same. Fontaine found himself outed and discredited when he collaborated with the RCMP to quash Indigenous unrest in 2007. His intelligence sharing with the police smacks of the Nicholas-penned PSCP agreement. As for Nicholas, he hired members of the Elsipogtog community on as peacekeepers, and also hired people from outside of the community. Suddenly summertime anti-shale gas protests alongside of the highways in Kent County were highly monitored affairs, with people wearing bright orange ‘Elsipogtog Peacekeepers’ t-shirts wandering around everywhere, some speaking to the police, some taking notes on clipboards. One of those bright-shirted protest monitors was former US National Guardsman and police officer –and Nicholas’ cousin- John Deveau. At some point, possibly due to failing health or prior commitments, Nicholas stopped being the public face of the Elsipogtog Peacekeepers. Handing over the daily duties to Deveau, Nicholas retired to a behind-the-scenes roll as Elsipogtog’s Public Safety Advisor, where he appears to remain. Deveau, for his part, took over the directorship of the ‘peacekeeping’ team, and is actively drawing a salary of $60,000 a year as the director of the ‘Wabanaki Peacekeepers’, essentially version 2.0 of the Elsipogtog outfit, but with better equipment and full-time salaries. Make no mistake. This is the pleasant name given to the Deveau-run joint AFN/RCMP crisis response team, the team that all summer long was liaising with SWN, the RCMP and Elsipogtog Band Council – all the while presenting itself as a neutral negotiating body to grassroots activists actually on the ground. October 16th, 2013: John Deveau gets outed by the grassroots. On Wednesday, October 16th, a crew of grassroots activists from Elsipogtog, as well as members of the Mi’kmaq Warrior Society, broke in on a John Deveau-chaired meeting. Present were numerous members of the RCMP, Elsipogtog ‘War Chief’ John Levi and several members of the Elsipogtog community. Elsipogtog elder – and Levi’s aunt – Norma Augustine requested that Deveau, as well as bad-faith RCMP negotiator “Dickie” Bernard, be escorted out of Elsipogtog First Nation. And by now the entire nation knows what took place on Thursday October 17th. Elsipogtog ‘War Chief’ John Levi’s influence upon the autumn anti-shale gas blockade along Highway 134 was virtually non-existent before October 17th. Levi, a clean and sober sun-dancer, has made much of what he perceived as the Mi’kmaq Warriors less-than-puritan lifestyle, and has privately used this as his reasoning not to attend the blockade. It is possible that some of these disparaging remarks were fuelled by the general misunderstanding over Levi’s role as Elsipogtog’s ‘War Chief’, and where exactly that placed him within the Mi’kmaq Warrior Society. In effect, it placed him nowhere. The Mi’kmaq Warrior Society operates as an independent body, with it’s own Chief and ranking system. For his part, Levi was appointed ‘War Chief’ of Elsipogtog by Noel Augustine, Keptin of District 6 of the Migmaw Grand Council. The Grand Council is a modern day facsimile of a traditional Mi’kmaq government style that does not appear to wield much more than figurehead-style power. Noel Augustine, for example, has issued a variety of eviction notices to SWN Resources Canada, all of which have fallen upon the deaf ears of the Texas-based gas giant. The more nefarious possibility is that Levi, under the influence of Deveau, could not infiltrate the encampment to any degree of information-gathering success, and thus reverted to a public smear campaign against the Warriors. In any case, with the violent takedown of the Warrior Society out of the way, Levi is once again a common sight at the quickly rebuilding camp along Highway 134. It has been reported that Levi’s main aim at Highway 134, however, is in actively trying to encourage activists to move towards last summer’s encampment along Highway 116. To boot, it has been reported that Levi is in negotiations with RCMP, offering the police that he can move the camp to the out-of-the-way Highway 116 location, in exchange for the police grounding their ever-present spy plane that continues to monitor the encampment along Highway 134. Despite the destruction of the encampment during the raid of the 17th, the Highway 134 encampment by far remains the more tactical of camps. SWN’s seismic testing lines are slated to be near Highway 11, one of the main arteries of transport in New Brunswick. Snap highway blockades, as occurred on October 19th as a show of defiance in the face of the RCMP’s raid, are also a quick and potential technique when the encampment remains on the 134. The 116 camp, arguably safer due to it’s proximity to Elsipogtog First Nation, is tucked far out of the way of any action save the falling of leaves. Sadly, especially considering the very real legal costs now being incurred by the five Warriors who remain without a bail hearing, Levi’s camp division has also reached a financial level. Splitting up donations from well-intention sources, including accepting money from the popular group The Indigo Girls, and then funnelling this money towards other side-projects, rather than towards the immediate legal costs of the Mi’kmaq Warriors, is only the tip of the iceberg. At the Wilsons’ gas station in Elsipogtog, there are now two donation jars side by side. One for donations to the Highway 134 encampment, and one for the Highway 116 encampment. Social media has also begun offering a variety of sources for donations. Most appear to agree that the Warriors’ legal defence fund, which has already paid out a retainer to lawyers Lemieux and Menard, is the grassroots choice for donations. APTN reported Monday that Chief Sock may well give the Elsipogtog band seal of approval, as it relates to anti-shale gas protests, to Levi. What exactly this means is entirely unclear. With a summer’s worth of experience in leading blockade-free anti-shale gas protests on the side of the highway, and with close friend John Deveau there to guide him, Levi may well be the front-runner for the band’s endorsement. At the rebuilding encampment along Highway 134, rumours continue to circulate of pre-October 17th tip-offs to the effect that Thursday would be a bad morning to be there. None of these rumours have been validated, yet, except for one. On the evening of October 16th, Lorraine Clair, whose van originally had been blocking the entrance to the compound where SWN Resources Canada’s seismic testing equipment was being held, left the encampment. She left with her van. It is unclear whether she had some kind of verbal altercation with members of the Mi’kmaq Warriors Society before she drove off. In any case, before leaving the encampment, Clair contacted Chris Sabas Shirazi, the senior member of the Christian Peacemaker Team that had been monitoring the Indigenous anti-shale gas activists from Elsipogtog since the summer. Clair asked Shirazi to leave the encampment with her. Shirazi then asked Elsipogtog elder Kenneth Francis, who was on the scene to give Clair’s dead van a battery boost if she should leave. Francis concurred that the CPT team should leave the encampment. In her attempt to justify fleeing a scene that in hindsight was in desperate need of some kind of independent monitoring to counter the RCMP narrative that is seeing multiple charges being levied at all six incarcerated members of the Warrior Society, Shirazi noted that Clair – after John Levi became a non-factor at the Highway 134 encampment – was her “community partner from Elsipogtog.” Rather than seeking a new “community partner” at a live situation with the very real potential for confrontation to erupt, it appears that the CPT’s partnership chain ended with Clair. So on the night of the 16th, at the request of Clair and Francis, the CPT left the as-yet peaceful encampment on Highway 134. In her defence, Shirazi did attempt to return to the site in the morning. She also took some great video – amongst many other great videos – of the secondary confrontation with RCMP on the morning of the 17th. Of the initial conflict, precious little footage exists that is not in RCMP hands. Clair, for her part, appears to have located a computer on the evening of the 16th. She wrote a short message, all in caps, and posted it on the most visited of social media sites. The message mentioned that the “peaceful” part of the protest was over, and encouraged all supporters to meet her and others at the Highway 116 encampment for a noontime ceremony on the 17th. It cannot be determined what Clair was basing her assessment on; as a first-hand observer I saw no violence break out at the encampment on the night of the 16th to suggest that the peaceful part of the encampment had ended. This entry was posted in Alternative Media Coverage. Bookmark the permalink.